Looking for a high-quality diving fin? 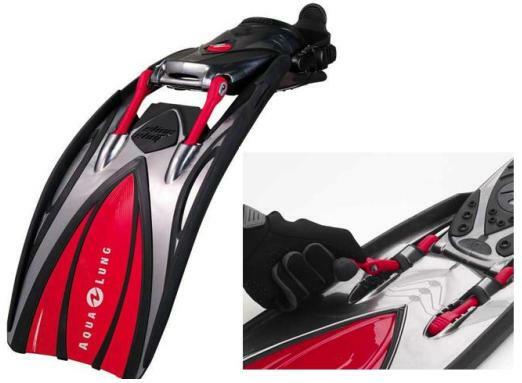 If so, check out the Aqua Lung SlingShot Heel-strap Diving Fin. This revolutionary product is one of the best diving fins you can find today on the market. You can use it to take the dive even in a storm. It will make your dives more efficient, comfortable, and fun. Slingshot diving fin comes with some innovations such as Gear Shift, Mid-foot Flex Joint, and Power Bands, which are specially designed to provide a great experience while diving. Power Bands are equipped with a pure silicone that provides a boost of energy on the power stroke and reduces fatigue. That allows you accumulate energy and reclaim it prior to the upstroke rather than wasting your energy like with some other diving fins. Those having a problem to find a comfortable diving fin that fits their feet. Ideal for travel enthusiasts and adventurers who like scuba diving. A great fin for shore diving, as well as other aquatic activities like snorkeling and underwater fishing. Thanks to the special power bands that significantly lessen fatigue, this fin is recommended to those who want to have a hassle-free diving. Being equipped with Mid-foot Flex Joint, it is perfect for people looking for a great flexibility on their diving fins. 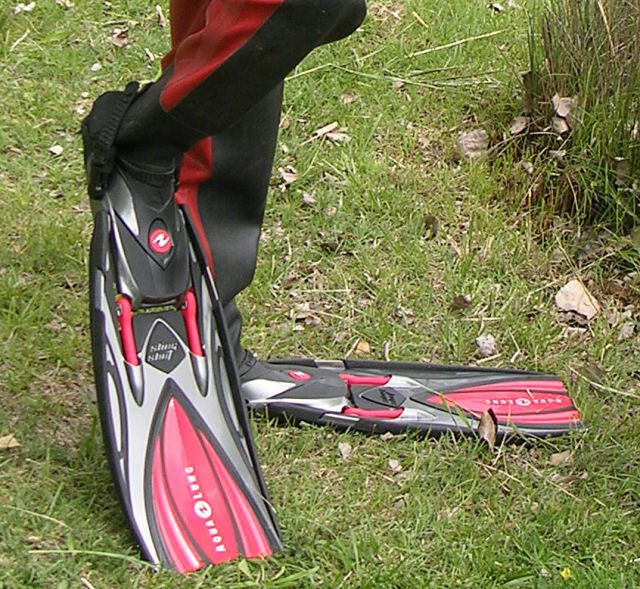 You are advised to wear boots, special water shoes, or scuba socks along with these diving fins for better grip. It isn’t recommended wearing bare feet. Since they are designed to conserve energy, you can safely use them even in strong currents. Fin in blue or red color is recommended to people planning to dive in places with a poor visibility. Otherwise, you can opt for the silver ones in the clear water. There are small and large sizes available for this fin, meaning both women and men can use it no matter what size of their feet are. It is suitable for all people regardless of their diving experience. Thus, they are recommended for expert scuba divers, recreational divers, but also for the beginners with no diving experience. Note: Though Aqua Lung SlingShot Heel-strap Diving Fin is ideal for any type of diving and underwater activity, it does not work so good for surface swims. The down-angle shape allows you to drop easily, however, you will have to put a lot of effort into generating a power at the water surface. Although Aqua Lung SlingShot Heel-strap Diving Fin is designed to fit the vast majority of customers, some people might have to wear the water shoes or boots with these fins to reduce friction on the top of their feet. These fins offer a great power with each stroke, which allows you to dive much faster and without much effort. The adjustable strap system is great and fits well in most cases. Easy on and off. The power bands make a huge difference in dive experience and set these fins apart from the rest. Most people use Aqua Lung fins for either diving or snorkeling. They are lightweight and very comfortable with the exception of the possible rubbing on the top of feet in some people. All functions are manual. Some users find that these fins could be better if fully automated. They arrived in perfect condition and on time after purchase. It is a great value for money. You’ll not regret to spend the extra money for them. Aqua Lung SlingShot Heel-strap Diving Fin is a perfect product for scuba diving and underwater activities. Its Mid-foot Flex Joint makes your dives more flexible and agile, while the Power Bands contribute to greater power with each of your strokes. That’s what makes the sharp distinction between this and other fins on the market. Feel free to share your own experience or left a comment about these diving fins. Obviously, you can buy the Aqua Lung SlingShot Heel-strap Diving Fin in any of your preferred diving shops, but here you can find a few online options. When searching to buy online, we must be sure that the product is available in your country. There are some restrictions on international sales and some e-commerce sites only ship the product to specific areas. Amazon.com : the selling price usually ranges from USD 120 to 185 depending on the selected option, with free shipping. Due to shipping restrictions, it’s possible that you´ll need to make a new search in your country Amazon site. Amazon UK: from just under GBP 100 and plenty of option to choose. Amazon Spain : at the moment I’m writing this review the price is fine, but it’s sold by a third part and the shipping costs are high. However, you can check if this already changed. On the other hand, they will ship the product all around Europe and to some other countries outside it. Hope this review will help you to make a decision in a purchase or not these amazing fins. Please, left a comment with your own experience or questions about the Aqua Lung SlingShot Heel-strap Diving Fin. Aqua Lung SlingShot Heel-strap Diving Fin seems to be very great choice and also price is quite OK. When checking their Amazon page I noticed the sizing there is quite interesting – this comes in sizes Small, Large and Regular. Could you please explain how to choose the right size? Open- heel fins are not generally size by shoe size, but by bands (in this case small, regular/medium and large). A rule of thumb with this fins is if your shoes are a 7 or smaller you’ll need a small size, shoes 8 to 10 a regular and 11 or bigger a large. But remember that you’ll need to wear boots and the heel-strap will help you to fit the fins properly. Here in Louisiana, there are a lot of chances for us to experience diving due to our location right by the Gulf Coast of Mexico. Scuba diving isn’t that popular though in Louisiana due to various unknown reasons. I’m curious whether or not you can provide cheaper alternatives to this as 100$+ will be a lot for some beginners to get starts with this hobby. There are lots of alternatives. If you check the amazon.com best sellers, you’ll find fins for just 20$.